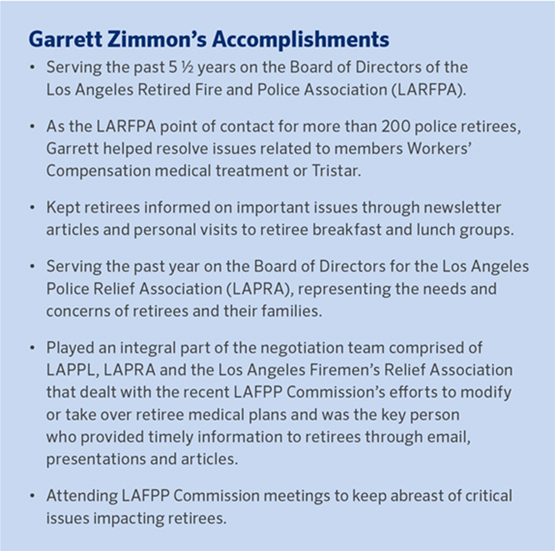 Garrett Zimmon, retired liaison on the LAPRA Board of Directors, is running for a seat on the Los Angeles Fire and Police Pensions (LAFPP) Board of Commissioners that is elected by retired police members with the term beginning July 1, 2019. The Fire and Police Pension System is administered by a Board of nine commissioners – five appointed by the Mayor and confirmed by the City Council, and four elected by members. 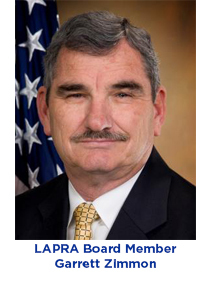 With retirement benefits under scrutiny, the opening for the retired police representative on the Board of Commissioners comes at a critical time. “It is vitally important that retirees know their representative is dedicated to understanding the issues and advocating for their rights and needs,” says Zimmon. “That’s why I’m running to fill the open positioned elected by retired police members of the LAFPP." Zimmon served 28 years with the Los Angeles Police Department (LAPD), and has extensive experience working with City Commissions, City Council Committees and a variety of employee groups and organizations. “I thoroughly research issues and have the depth of experience to understand and analyze the staff reports acted on by the LAFPP Board of Commissioners,” says Zimmon. Ballots will be mailed to eligible voting members beginning March 27, 2019. Voters who wish to submit their ballots in person may do so beginning April 16, 2019. doors. To be counted, all completed balalots must be received by mail or in person by the Office of the City Clerk - Election Division by 5:00 p.m. PST on April 23, 2019. Questions regarding the election process may be directed to the Office of the City Clerk — Election Division at (213) 978-0440 or the Administrative Services Section of the Department of Fire and Police Pensions at (213) 279-3080.